Violinists who have received conventional classical violin lessons, will find that there is a fascinating new field of musical expression opened up for their enjoyment. Folk fiddle players (including those who are largely self taught) will find a wealth of information on the different styles of fiddle music from the Cotswolds, Northern England and the Scottish Borders, the West Highlands and Islands, Shetland, and the north, west, and south west of Ireland. The book contains detailed transcriptions of 75 tunes with bowing and ornamentation marks and an accompanying commentary covering the characteristics and technical demands of each tune. Many of the transcriptions are based on first hand field recordings and some tunes are presented with different regional variants. An accompanying set of recordings can be accessed on this site by clicking on the fllowing links. Playing by ear, from memory, and "off the page"
"..strikes a fine balance between the scholarly and the practical"
"... a concentrated and insightful work that will be of value to experienced players and newcomers alike." "It is the book that I wanted to find 25 years ago when I told my music teacher that I really wanted to play folk fiddle not the violin"
"Having always cast a jaundiced eye on the whole idea of learning folk music from a book I was ready to write a very critical review of this one. On close examination I can't fault it. Succinct and thorough and best of all not didactic." "Fiddle music sounds good or bad according to the skill with which it is bowed and here at last is a book that recognises that fact from page one." "I recommend it to everyone interested in folk fiddling whatever their ability, but especially to those who can get their fingers in the right place but can only use the bow like a nail file." 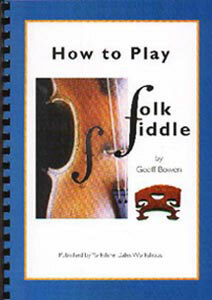 "If you're thinking of taking up fiddle or are already playing and struggling then buy this book. I wish I had had a book like this when I first started playing." "Geoff's teaching skills were clearly demonstrated when he ran fiddle workshops for 'In With A Chance' and I would highly recommend him to anyone thinking of holding a fiddle workshop"